In stock -This product will ship today if ordered within the next 40 minutes. 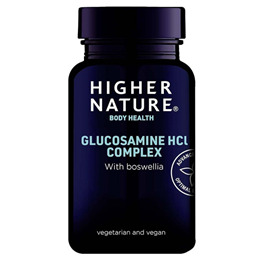 Glucosamine has become one of the country`s favourite health supplements, not surprisingly, since it helps maintain flexible joints. We`re thrilled to be able to offer the first vegetarian glucosamine hydrochloride, made from corn. Glucosamine is an international bestseller, chosen to help maintain healthy joints and muscles. This superior form of glucosamine is 99% pure and more bio-available than glucosamine sulphate. Since glucosamine provides a major component of cartilage, it is believed that glucosamine may help support and maintain healthy joints. Glucosamine is also important for maintaining healthy skin. Adequate amounts of it in the blood are necessary for the production of hyaluronic acid, one of the substances essential to heathy skin. Therefore, glucosamine may play a major role in the support and maintenance of healthy skin. Natural production of hyaluronic acid decreases as individuals age, which may contribute to wrinkling of the skin. It is thought that increasing glucosamine may help support healthy skin in staying more resilient. Glucosamine HCI*, bulking agent: microcrystalline cellulose; (anti-caking agent: silicon dioxide); coating: hydroxypropyl methylcellulose (glycerine); anti-caking agent: magnesium stearate*. Take 1 - 2 tablets a day, with meals, for one month, then 1 tablet per day, or as your health professional advises. Below are reviews of Glucosamine Vegetarian Formula - 180 Tablets by bodykind customers. If you have tried this product we'd love to hear what you think so please leave a review. Very good product, joints feel a lot better went out walking. I have been regularly taking 1 MSM Glucosamine Vegetarian Formula tablet par day for many years now. I am confident that it helps me retain the suppleness of my joints & hence enables me to continue cultivating a 45ft x 45ft allotment at 78yrs young! Now available for vegetarian and vegans. 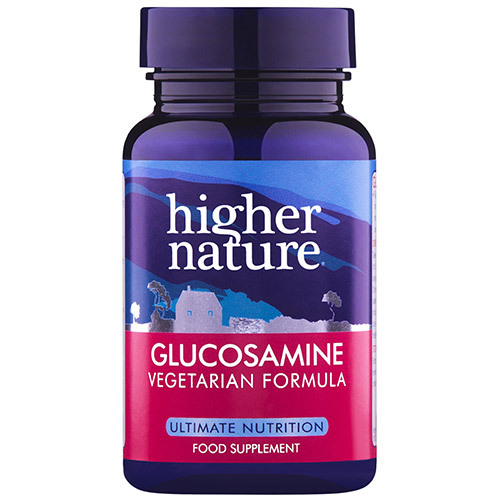 Glucosamine is an international bestseller, chosen to help maintain healthy joints and muscles.